Why would anyone in their 94th year, without consulting a psychiatrist, agree to descend from the top of Toronto’s City Hall on a rope? My wife thought I had gone mad. Surreptitiously, I momentarily agreed with her! So what was it like descending (rappelling) from the top of a 30-storey building? And why did I do it? Nonagenarian retired Toronto physician Ken Walker, 94, is a Harbourfront resident and internationally syndicated columnist under the pen-name Dr. W. Gifford-Jones, MD. 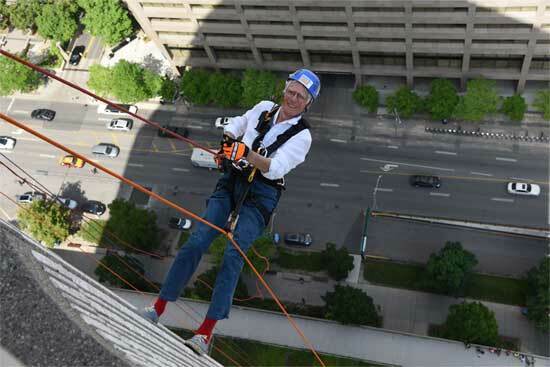 In support of a charity, he joined his son in a breath-taking rappel off Toronto City Hall. Photo by Gordon Cheong. My son is one of many volunteer WISH Grantors for Make-A-Wish Canada. It grants wishes to children who have life-threatening illnesses. Since 1983 it fulfilled all kinds of requests for 6,800 children. And each year 600 more are granted the wishes of their dreams. I discovered that my son was rappelling not only for a great cause but also for his current wish child, Kyle. It occurred that I might join him in this worthy cause. So what wishes do these children seek? You may have guessed that many young children want to go to Disneyland and meet Mickey Mouse. Some ask for the experience of meeting a firefighter. Others who hope to become a ballerina want to meet one. This boy’s dream caught my attention. As a boy I had never dreamed of landing fighter planes on an aircraft carrier. But years ago, the U.S. Navy flew me as a medical journalist onto the deck of the nuclear aircraft carrier USS Nimitz during its manoeuvres in the Atlantic. I was sent to report on its medical facilities. So this boy was on my mind on June 9th as I approached Toronto City Hall. I could see people already descending the building by rope and my first thought was, “Holy Cow! I’m going to be up there soon!” which left me with a combination of excitement and considerable apprehension. Once on the roof of City Hall, I was struck by the incredible view of Toronto; possibly too good a view as I considered the height! Then the highly trained staff from OVER the EDGE began fitting my son and me with harnesses. 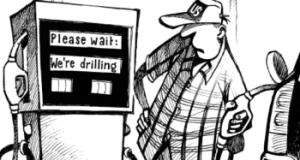 Instructions followed. What to do with hands and feet on the way down, and just as important, what not to do. Finally, with much preparation I climbed cautiously over the top of Toronto’s City Hall. Then, with my son beside me, we descended slowly down the wall for the next 20 minutes. Now that I’ve landed safely on Terra Firma I can hardly believe it’s happened. My hope is that this column will make more people aware of the good deeds of Make-a-Wish Canada. Consider the experiences many of us have had over a lifetime. These children with life-threatening disease are asking for just one single wish. How could anyone refuse? So in the end my decision, crazy as it may have been to drop down the side of a tall building in my 94th year, ended well. And as the oldest one to do it, a nonagenarian, it resulted in a spectacular and gratifying day.